From Melbourne one of the most popular self-drive routes for tourists to follow is the circular Great Southern Touring Route, which includes spectacular scenery and takes in some of Victoria's most beautiful, scenic and cultural attractions. The first part of the route hugs the coastline going south along the Great Ocean Road, renowned for its coastal scenery, passing lush Otways rainforests and on to the magnificent limestone rock sculptures known as the Twelve Apostles in the Port Campbell National Park. 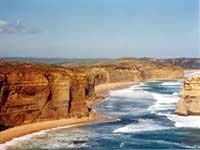 Other attractions along the Great Ocean Road include the historic villages of Port Campbell, Queenscliff, Portland and Port Fairy, as well as resort towns and coastal cities such as Torquay, Apollo Bay, Geelong and Warrnambool.